NEW! Fragrant Delight Extends the Lilac Season. Extended-blooming Miss Kim blossoms even later than the French Hybrids Syringa patula ? 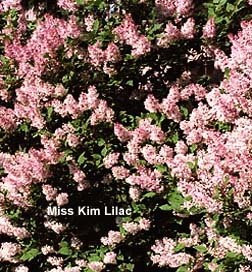 Miss Kim Lilac is a rare and charming Lilac, growing more compact than the French hybrids (only 6 to 8 feet). Abundant, and beautiful panicles of very fragrant, single blossoms, pink to purple in bud and changing to ice-blue when mature, extending the Lilac season by blooming weeks after the French hybrids have finished blooming. Miss Kim has the best fall color on any lilac, a beautiful burgundy-red.